The booster RF power source is a 60 kW klystron transmitter. A 50 ohm 6 1∕8” EIA rigid coaxial line run feeds the five cells resonant cavity (DORIS type). A high power circulator shields the transmitter from any reflected power. Frequency, amplitude and phase feedback loops keeps the proper accelerating voltage along the cavity. At the repetition rate of 2 Hz, the electromagnetic field level in the cavity is raised in a linear ramp from the low voltage, 40 kVolt to the high one, 600 kVolt. The ramp’s timing depends on the electron beam energy: the low 40 kVolt is the minimum field level obtainable in the cavity and it is required to capture the beam at the booster injection. Once the beam is captured, this field shall be raised to match the increasing energy need of the beam, up to the final extraction level. 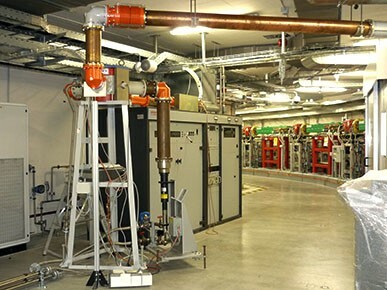 The storage ring RF systems shall replace the energy lost by the electron beam turn by turn. Because of the full energy injection and the top up operation, the energy delivered by the RF systems is almost constant. Four ELETTRA type cavities are installed in the short straight section of the storage ring. The ELETTRA type cavity is a single cell, made of oxygen free high conductivity (OFHC) copper. Each cavity is powered by one RF source plant. 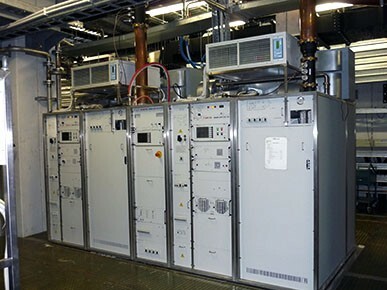 Three RF power source are the 60 kW klystron transmitters and the RF power line is a coaxial one. Last transmitter is a 150 kW Inductive Output Tube one: waveguide WR1800 run is then used to deal with such power level. All the plants have high power circulator to decouple the transmitter from the load. Frequency, amplitude and phase feedback loops on the RF chain keeps the proper accelerating voltage along each cavity, according to the stored electron beam need. The RF phase shift among the RF plants can be precisely arranged. The longitudinal High Order Modes (HOM) of the cavity are not damped. Their high quality factors allow to tune them far away from the beam resonances by mean of the accurate cavity cooling temperature set (temperature accuracy = 0.1° C) in order to avoid any dangerous beam-HOM interactions.